It takes some time before you can adapt to your new dentures in Atlanta GA and no longer feel awkward about having them on. In fact, it’s normal for you to bite your tongue or cheeks while you are still learning how to use your dentures properly. The reason for this is because your cheeks and palate are extremely sensitive, containing numerous nerve endings. However, if the irritations continue after a week or so after getting your dentures, then you might want to visit your dentist and have him or her take a look at your dentures and how they fit you. The simple task called brushing can be complicated once you have dentures on. But do not worry too much. Basically, at the end of the day, you should take off your dentures. Doing so will allow your palate and your mouth to breathe. Brush your remaining natural teeth before you move on to your mucous membranes. You should gently brush the your gums, palate and your tongue whenever you remove your dentures and before you put them on. You should also brush your dentures slowly at night in order to remove any dental debris which may have adhered on the nooks and crannies of your dentures. Given that you place your dentures inside your mouth everyday, it’s only natural that you should disinfect them prior to using. Dentists recommend placing your dentures in a cleaning solution overnight provided that you brush them beforehand. You can also make use of an ultrasonic cleaner, however, doing so should not be done in lieu of brushing. Whenever you do brush your dentures, make sure to place a folded piece of towel on the sink to prevent your dentures from being damaged should the accidentally fall. 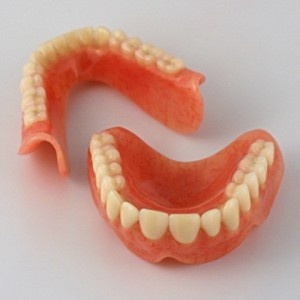 Dentures have a lifespan of around five to seven years before they must be re-made. Your gums and bones will change over time, so this means that just because your dentures fit now does not mean they will continue to fit over a period of time. Not replacing dentures which no longer fit properly can lead to irritation.